Can Animals Return as Ghosts? The above quote is a response given by the late British author and veterinarian James Herriot when he addressed the question whether or not animals have souls and could experience an afterlife. His response was received with appreciation from people all over the world. Herriot was one of the first well-known animals lovers to address this topic. If you believe the above then the possibility exists that some animals do indeed return in ghostly form. A popular post on this blog is about “Ghost Cats” and the intriguing video my group caught of a “possible” ghost cat. I received many positive responses to this post through email and in person. This topic is close to many people’s hearts. Numerous witnesses over the years have seen what they feel are deceased pets come back to visit. 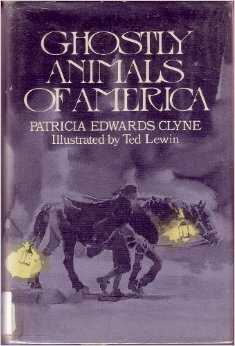 A good book about this topic is Ghostly Animals of America written by Patricia Edwards Clyne. Many people have seen the ghosts of animals over the years--not all of them former pets. The following story is an unusual one. There is a busy intersection in Cook County in a suburb or Chicago. Until recently this intersection did not have a traffic light. The speed limit in the area is 45 mph but cars often drive through this intersection going 50 mph plus. Drivers especially at night have trouble seeing this intersection because there is a rise, which blocks their view until they actually cross it. A riding stable is located near this intersection. This stable has extensive wooded riding paths and one of these paths crosses this intersection. Unfortunately, because of this dangerous intersection more than one rider has been injured or killed at dusk or at night when a car has hit them while they crossed this road. Several horses have been killed in these accidents as well. Drivers along this road have reported seeing a strange phenomenon. They see what appears to be a “smoke grey silhouette of a horse and rider.” Neither figure has distinguishable features. They are most often seen right in the middle of the road. This strange duo is seen at night crossing the intersection. Some have reported that they saw this horse and rider appear in front of their cars suddenly but as they slowed down this “silhouette” just faded away. Some grisly reports state that drivers have actually seen one of these accidents reenacted in this intersection. These accounts include witnesses seeing a rider being thrown from their saddle and then just disappear. Others state they actually saw a fallen horse dragged by a car until it came to a complete stop. Ambrose Small, a millionaire Canadian theatre producer disappeared in 1919 without a trace. This crime at the time was touted in international newspapers as the “Crime of the Century.” His disappearance is considered one of Canada’s great mysteries for this case has never been solved. Just the day after Small sold his theatre chain for 1.7 million dollars he was seen leaving--The Grand Opera House in downtown Toronto, Ontario after a night performance. He was then seen buying a newspaper and was never seen again. Last place Small was seen. A $50,000 reward was offered and the police conducted an extensive search--literally for years afterward-- but no valuable leads were ever discovered. Small was declared legally dead in 1923 but the case was not officially closed until 1960. People are still fascinated by this case and several books have been written about it. 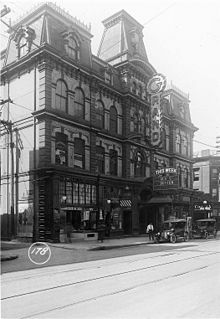 Yet another mystery is connected to Ambrose Small for it is said he still watches over--haunts-- his favorite theatre, The New Grand Opera House located in London, Ontario that he opened in 1901. 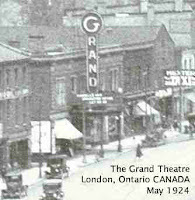 Today this theatre is called The Grand Theatre. Just a month after his disappearance a night watchman at the New Grand Opera House reported seeing a ghost that looked like Mr. Small. Ever since there have been countless sighting of Ambrose Small in this theatre. Small’s apparition has been seen by cast, crew and by theatre patrons. He is often seen in his favorite balcony box sitting in his favorite seat. Even when his ghost is not seen the seat on this chair is seen going down when he arrives and popping back up when he leaves. It is said he never misses an opening night. He is also often seen walking the theatres catwalks. Phantom footsteps have been heard for years around the theatre. A ladies man in life--Small is said to still be partial to the ladies. Several actresses that have performed at the theatre over the years state that they heard their name whispered in their ear and have felt something messing with the hem of their gowns. Actors have even reported seeing him floating above the heads of the audience during performances. In 1927, comedian Beatrice Lillie saw Small's ghost beckon to her during a performance. It is said as she moved toward him a theatre prop chandelier crashed down almost hitting her. In the summer of 1957, a teenager Jay Campbell who later was to become a local television meteorologist and his girlfriend saw a figure climbing a ladder off stage. "It really didn't look like a person but from the waist up it had the form of a person." The theatres electrical equipment often malfunctions. These occurrences are always blamed on Small. But Small is considered a benevolent ghost and he performed a great service for the theatre in 1977, which many appreciate. 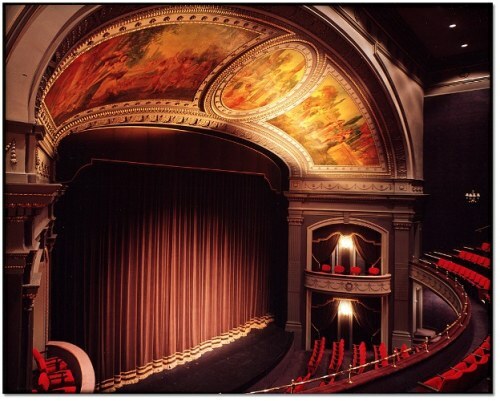 At this time the theater was undergoing a major renovation. A backhoe that was being used to knock down a wall came to close to the theatre’s historic west wall arch mural. This painting if destroyed could not be replaced. It is said this machine stalled without cause just seconds before this wall came crashing down. It is felt Small stopped this machine. To this day the theatre displays the two remaining bricks that kept this arch in place. Recently, people in various parts of the theatre have been hearing an unexplained “hissing sound.” The source of this sound has yet to be discovered. Some feel it must be Ambrose Small just making his presence known. This link is to an interesting 7-8 minute video on youtube that has witness descriptions of many of the encounters with Ambrose Small’s ghost at The Grand Theatre. When aficionados of ghost stories in Ohio get together there is one story that is always mentioned--the legend of Gore’s Orphanage. This story takes place in Vermillion, Ohio. 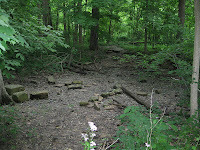 It is often listed in the top ten most popular ghost stories in Ohio. As mentioned the story of Gore’s Orphanage is only a “legend” but at the end of this post I will share the true story of why this area might possibly be haunted. This legend starts with a tragic fire. 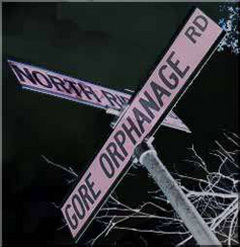 It is stated that a man by the name of Gore ran an orphanage in the 1800s. He didn’t particularly like children and it is stated he often abused the chargers that were entrusted to his care. In one version of this tale Gore wanting to collect “insurance money” decides to set the orphanage on fire. He callously stands by and watches all the orphans perish in the fire. Other tales state that it was a “disgruntled employee” of Gores who actually set the fire in order to exact revenge on his former boss. Or it is stated that the culprit was a “crazy neighbor” who was tired of all the children’s noise. Yet another reason sometimes told is more benign in nature. 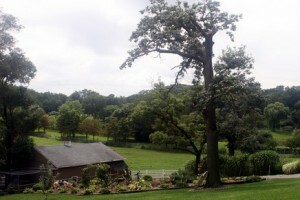 It is stated that an orphan actually knocked a lantern over which set the barn on fire. Then the flames quickly spread to the orphanage’s main building. All these versions mention that all the orphans perished in this fire. It is stated that the neighboring townsfolk not wanting a reminder of this terrible tragedy razed the remaining burnt shells of the buildings leaving only the corner foundations. But this tragedy was not so easily forgotten for soon after the fire the locals started whispering that at night strange activity occurred near the site where the fire occurred. Some reported seeing the ghostly shapes of the dead children playing in the woods. Other tales included more dramatic sightings. Witnesses stated they saw these poor orphans still on fire running and screaming for help. Yet other sightings included tales of bright lights that were seen bobbing and weaving through the trees. Many felt these lights must be these children’s spirits. One darker tale started to be circulated. 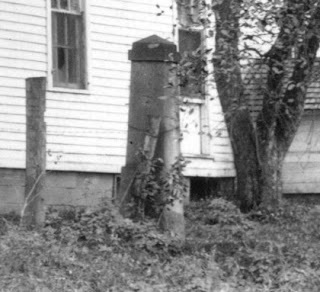 A tall dark ominous figure was seen standing near one of the corner foundations. It was believed this figure was probably the person that was responsible for setting the orphanage on fire. Many witnesses over the years have seen activity in this area but not for the reasons listed above. The Gore Orphanage never existed. A road in the area is called “Gore Orphanage Road” because of two other reasons. Early surveyors named the road after a “gore” which is a word they use to denote a wedge-shaped piece of land. Later the word “Orphanage” was added when the Orphanage of Light and Hope took ownership of the property in 1903. A man by the name of Joseph Swift purchased the land in 1817 and over the next 20 years he built a mansion named after him. He sold this beloved mansion for financial reasons in 1874 to Nicolas and Harriet Kellogg Wilbur. Tragically, four of their great-grandchildren died in the home from diphtheria. It was at the height of the Spiritualism movement and the Wilburs overcome with grief tried to communicate with their deceased great-grandchildren by holding a series of séances at the mansion. In 1895 the Wilbur family sold the mansion to the Sutton family, 7 years later they sold the property to the Rev. 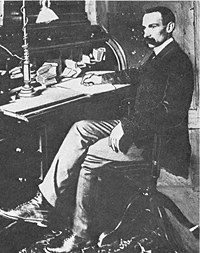 John Sprunger in 1903 to be used as part of the Orphanage of Light and Hope that he and his wife founded. 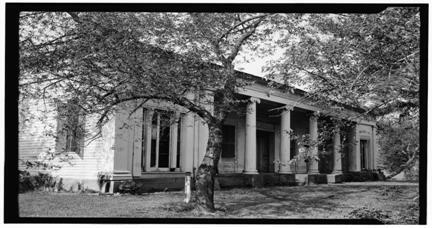 This orphanage closed down in 1916 and the old Swift Mansion left abandoned burnt to the ground in 1923. It was at this time that the rumors about the hauntings started to be reported. So children did die on the property but from diphtheria not a fire. Are the more benign ghost sighting that are seen in the area near where the Swift Mansion once stood --actually these four great-grandchildren instead? 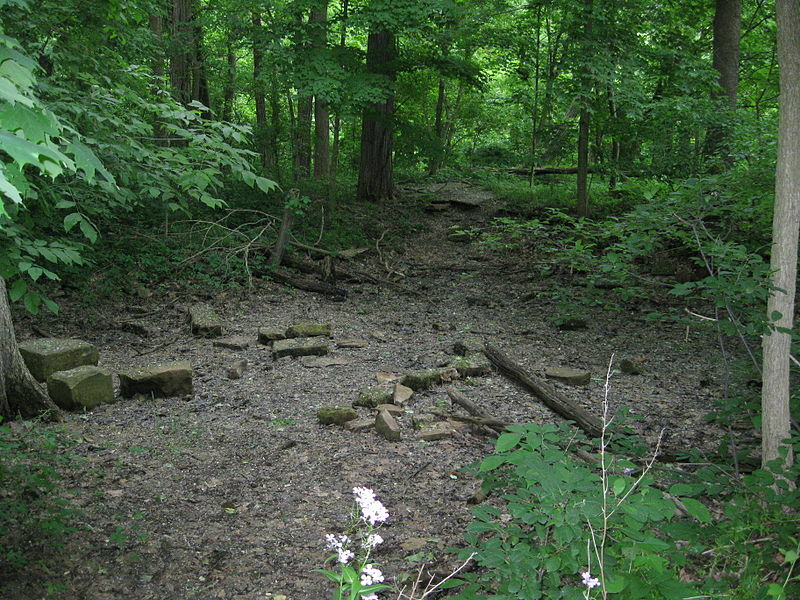 In 1992 the old Swift mansion site and 1500 acres of the Vermillion River Valley were purchased by the Lorain County Metro Parks.